Scientists propose naming a new epoch in time the Anthropocene—the Age of Man—dating from the time human activities began having global impacts on Earth. A mini-retrospective of films on that theme by local environmental filmmaker John Grabowska screened at the National Park Service Centennial Film Festival at the National Conservation Training Center (NCTC) in Shepherdstown on February 25. The screening highlighted three diverse ecosystems: Alaska’s Wrangell-St. Elias National Park, North Carolina’s Outer Banks, and New Mexico’s Jemez Mountains. If you missed these films, you will have a chance to see two of them, “Ribbon of Sand” and “Sky Island” on March 19 in Washington D.C. as part of the Smithsonian’s “Living in the Anthropocene” initiative and the Environmental Film Festival. 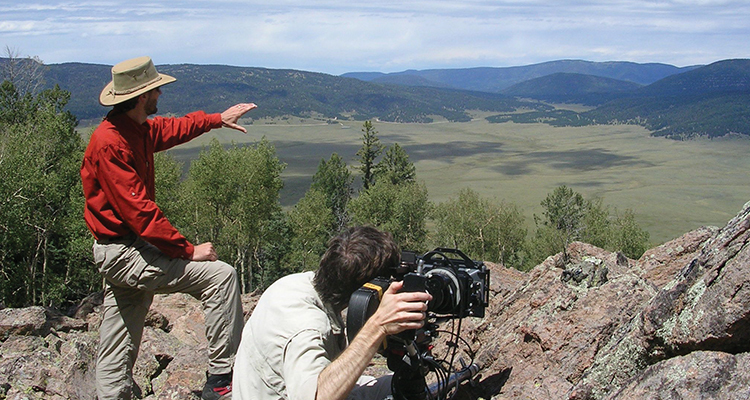 Film crew on the rim of the Valles Caldera, Jemez Mountains, New Mexico. Photo by Hilary Grabowska. “Ribbon of Sand” is a lyrical exploration of Cape Lookout National Seashore (NC), a 60-mile strip of ever-moving, roadless sand—one of the few natural barrier islands left in the world—and the coastal plains, salt marshes, and sounds of the Outer Banks. This ecosystem, born of the movement of waves and wind, is the home of countless living things, from bears to crabs to intricately shaped single-celled phytoplankton, called diatoms. Rising seas caused by warming temperatures threaten the Outer Banks, while the efforts of humans to tame the movement of the sand are an exercise in futility. Meryl Streep beautifully narrates the film, with readings from Rachel Carson’s poetic musings. “Sky Island” examines the unique world of New Mexico’s Jemez Mountains. Created by volcanic action, they rise from desert floor to 11,000-foot peaks. Ruins of ancient Pueblo cultures haunt the lower canyons and plateaus—iconic backdrops for western movies. Separated from any other mountain ranges, the isolated alpine peaks gave rise to unique flora and fauna. Climate change allows no escape for the animals and plants. High-elevation, low-temperature animals are already at the limit of their range. Diminished snow pack, along with misguided fire suppression, has killed much of the native forest, turning piñon pine forest into grassland. “Sky Island” is also narrated by Meryl Streep, along with award-winning Native American author, N. Scott Momaday, reading from his own works. Grabowska grew up in Aberdeen, South Dakota, where his parents were college professors. He loved the outdoors, and he and his brothers spent countless hours in the stream and fields on the edge of town. Their home was full of books and maps, and he was an avid reader. Their father grew up on the northern adventure stories of Jack London and other popular writers, and the family spent summers on the road in their station wagon, camping and exploring to the north and west, including a memorable car trip to Alaska. From Aberdeen, Grabowska went on to Washington, D.C., to work for his congressman. However, he went from creating his own work to being what he describes as a cog in a machine. “I was unhappy on the Hill, but I learned a lot,” he said. He and his wife, Monica, eventually joined the Peace Corps, where they served in Honduras. People were needed to teach “killer (Africanized) bee” beekeeping, and no experience was necessary. Since there are few experienced beekeepers, and they tend to be older and unlikely to take such a post, the Grabowskas received a crash course in beekeeping. After the Peace Corps, Grabowska hoped to break into documentary filmmaking. In a rare stroke of serendipity, he met someone-who-knew-someone-who-knew-someone-etc., who worked at the National Park Service (NPS) Harpers Ferry Design Center, where interpretive media for national parks is created. A filmmaker had retired, and they were looking for a replacement who knew video and wouldn’t have to be trained. Grabowska arrived at the right time, and has developed films for NPS visitor centers all over the U.S. ever since. 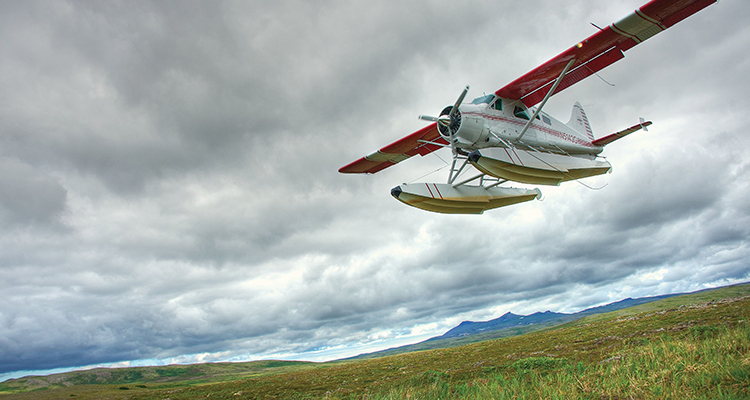 A bush plane (de Havilland Beaver, the SUV of bush planes). Photo by Roy Wood. “My films aim to make people think about the essence of a place—to make the audience respond and care about the place,” he emphasized. Now Executive Producer of visitor center productions, Grabowska explains that he has an idea and an approach, but hires people to make the films, and often has several projects going on at once. If he’s working on a film himself, it’s probably for a particular park—where people know him and have requested him. Similarly, for his film on Alaska’s Katmai Peninsula, he hired two cinematographers who lived there and could film when weather permitted. He gave them locations and lists of what he wanted them to shoot. He went up for certain events, such as when the brown bears, stars of the film, showed up to fish for salmon. Grabowska explains that his visitor center films are of necessity rather short, because their purpose is to get people outdoors experiencing the park. But his audience usually doesn’t need the encouragement, and over the years, he began to feel like he was preaching to the choir. To reach a wider audience, Grabowska made longer versions of his films to submit to PBS and film festivals. As a result, his films have won awards internationally, aired in primetime on PBS, and even ended up in local schools.